As part of an extensive consultative process towards the development of the new Strategic Plan for the Durban University of Technology (DUT), Vice-Chancellor and Principal, Professor Thandwa Mthembu engaged with the Faculty of Arts and Design on Tuesday, 29 January 2019 at the Arthur Smith Hall, City Campus in Durban. This engagement was attended by Prof Mthembu, Strategic Plan – Working Group, academic and support staff from the Faculty of Arts and Design. 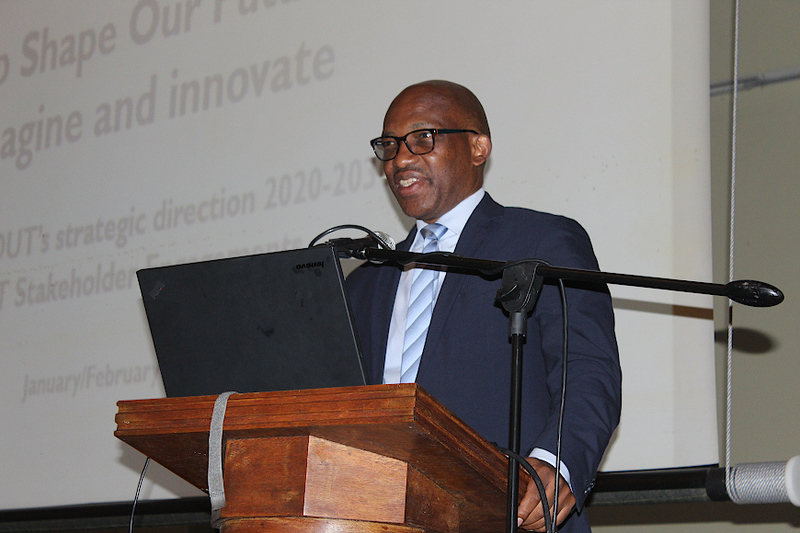 Prof Mthembu said his engagement with various University stakeholders is informed by the fact that the current Strategic Plan (2015 – 2019) will finish its term at the end of the current year (2019). “So there is a need for the University to think innovatively and creatively about its future beyond 2019,” he said. He said in guiding this important task, it was essential to establish a Working Group which is mandated with driving the initial phase of developing the new Strategic Plan. “The Working Group is responsible for coming up with some initial ideas on the whole process and also on how our future could look like,” he said. “The members of this group were selected on the basis of partly their previous experiences with Strategic Planning processes, some of them because they have professional experience when it comes to strategy, some of them because they are new to the University and some of them because they have historic understanding of the University. So in order to get started as the University with drafts and ideas around developing our Strategic Plan, we had to start somewhere, and that is why we rely on this Working Group for that purpose,” explained Prof Mthembu. Prof Mthembu further outlined the purpose of these engagements with various stakeholders of the University. “Whatever ideas that are presented here are just initial ideas from myself and the Working Group. So there is nothing cast in stone, and part of the reason we are here is to have more engagement with you and get more ideas from you,” he said. He also added that the University is considering expanding the term of the Strategic Plan from the normal 5-year term to a 10-year term. “Looking forward, we are of the view that we should be looking at a 10-year horizon. Two of the most important reasons for that is the National Development Plan and the United Nations Sustainable Development Goals, and it is very important for the University to make an impact locally, regionally, nationally as well as globally, and to make sure that it aligns its activities with national and international developments. So we felt that the 2030 horizon is more appropriate if we want to gauge ourselves against national and international developments like Sustainable Development Goals. And also a 5-year horizon is limited if you want to do greater things, so 10 years is more practical if we want to change the face of this University beyond recognition because we really have bigger plans for the University,” Prof Mthembu said. Following a comprehensive presentation by Prof Mthembu, staff members from the faculty were given an opportunity to ask questions and comment on ideas presented by the Vice-Chancellor. In her input during this session, Faculty of Arts and Design, Executive Dean, Dr Rene Smith said perhaps the idea of an entrepreneurial University will require the University to align its policies and systems to be more responsive to this idea. She was reacting to the proposed new DNA strands: People – Centred and Engaged as well as Innovative and Entrepreneurial. All attendants were given an opportunity to submit their suggestions to the Working Group by completing a brief questionnaire. As part of his broader engagements with University stakeholders, Prof Mthembu together with the Working Group will meet with all Faculties and Administrative Divisions. These engagements are scheduled between 28 January 2019 to 14 February 2019. Pictured: Professor Thandwa Mthembu addressing the Faculty of Arts and Design.